FreshStartups.org is a site dedicated to showcasing new and interesting startups. Users can submit their startups, review startups and save them in a favorites list. FreshStartups.org is a great place to stay connected with web startups. 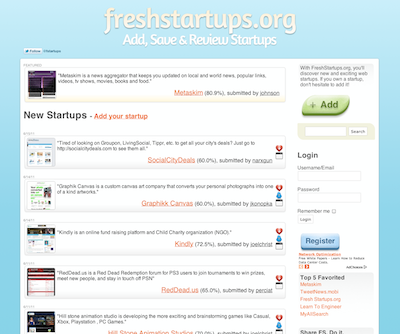 Unlike other sites that cover startups, FreshStartups.org utilizes a whole community instead of just one editor. People can fave startups they really like as well. Next post: 8minutes – How Many Comments Can You Get in 8 Minutes?